Betsy Barrett is an adjunct instructor at UW-River Falls. Previously, she taught at UW-Stevens Point and Elmhurst College. She earned her BA from the College of Wooster, her MS from Miami University in Ohio, and her PhD from the University of Minnesota. 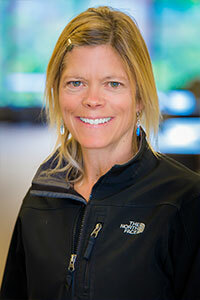 She volunteers at the National Wellness Institute; runs (with her yellow lab, Croix), bikes and swims; and savors time with her family (husband, Tom, and sons, Mack and Tate).